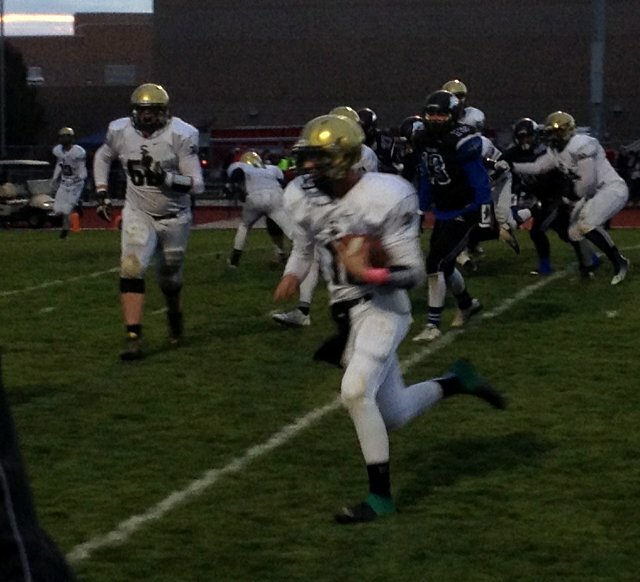 TOOELE –After falling behind early 7-0, the Snow Canyon Warriors, forced five turnovers and scored six times on the ground en route to a 55-28 throttling of the Stansbury Stallions in the first round of the 3AA state football playoffs Friday at Stansbury High School. The Warriors got caught napping early when Colton Christian found Casey Roberts for a 53-yard strike, but SC took over the game from there as the Warriors answered big time, relying on their offensive line to open up running lanes, and taking advantage of some key turnovers to score 28 straight points. Snow Canyon later capped the half with a Matt Kitchen 36-yard interception return for a touchdown to take a 35-14 lead at halftime. Barnes, who found the end zone three times, finished the day with 159 yards rushing. It didn’t hurt either that SC signal-caller Jackson Nowatzke led the team in rushing with 163 yards and scored twice himself. 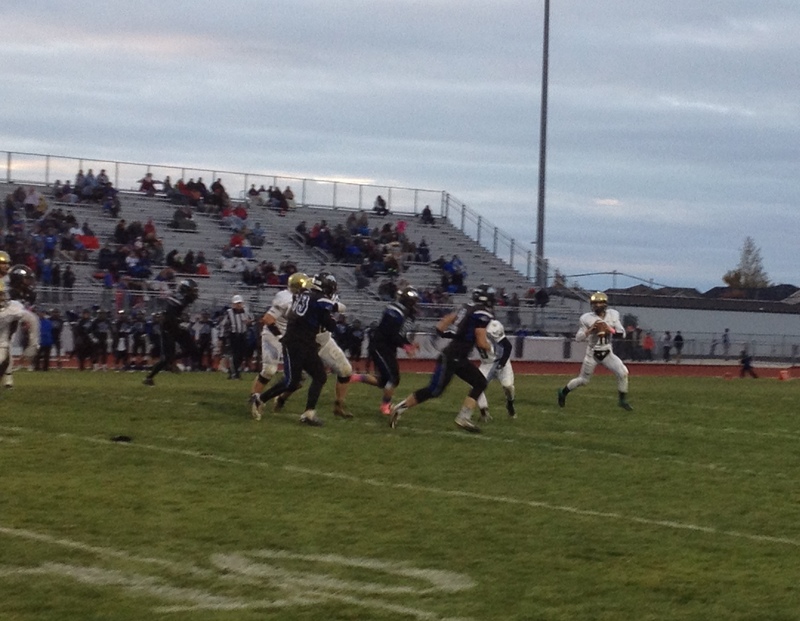 During the 28-0 run, Snow Canyon forced 2 fumbles and played stiff defense, which led to Barnes scoring from 12-yards out, Dylan Perry diving in from the 1-yard line, Nowatzke calling his own number and sneaking it from 1-yard out and Nowatzke ripping off a 64-yard scamper. At that point, Stansbury (down 28-7) worked to stop the bleeding and put together an impressive drive that was capped with a 9-yard Julio Reyes touchdown run to make it 28-14. With just two minutes before half, Stansbury stopped SC on downs and attempted to pull some trickery to get back in the game. In what may have been the turning point of the game, the Stallions double-pass was quickly sniffed out and the passer was hit as he threw, making easy work for sophomore Matt Kitchen on his way to a 36-yard pick-six. Warrior head coach Marcus Matua said that SC’s defensive success was a result of hard work and sound discipline. In the second half, the Warriors rode their first half momentum, tacking on two Andrew Day field goals and two Barnes TD runs, from 2-yards and 21-yards out. In what would prove too little, too late, Stansbury’s stud half-back McCoy Diderickson ran wild, busting out two long touchdown runs from 55 and 64 yards out. With this win, Snow Canyon improves to 5-5 and advances to the second round. The Warriors will stay in town and draw a rematch with rival Desert Hills. In their last meeting, SC was shut out 35-0 by the Thunder. An optimistic Matua said that the state playoffs give his team a fresh slate to work with. With the loss, the Stallions are out of the playoffs and finish their season 7-4.